ACPA's Roadway Concrete Pavement Design Workshop is a hands-on two-day workshop that will cover general background details on the variables considered in concrete pavement design and which design method is appropriate for a given set of conditions. It will also showcase new construction and overlay design methodologies common in the U.S.
ACPA National Pavement Design Workshop, Rosemont, IL (ACPA Office) ... May 14 and 15. 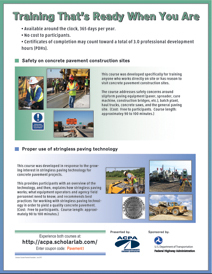 ACPA Workshop: “Applying LCCA for Fair Pavement Type Selection” - 10 am to 2:30 pm (CDT).... June 24. ACPA National Workshop on Industrial Pavement Design/Construction, Rosemont, IL (ACPA Office) ... October 21 and 22. • Available around the clock, 365 days per year. • No cost to partici-pants. • Certificates of completion may count toward a total of 3.0 professional development hours (PDHs). 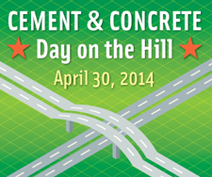 • Presented by the American Concrete Pavement Association; sponsored by the Federal Highway Administration. CONCRETE PAVEMENT PROGRESS (CPP)- Now in our 10th year of publication, CPP,contains vital information about the transportation industry, along with relevant news and new industry trends. CPP is mailed directly to ACPA members, as well as executive-level public officials representing federal, state, and local agencies. This includes key decision makers reperesenting concrete pavement contractors, cement companies, equipment and material manufacturers and suppliers, as well as a wide range of product and service suppliers to the industry. Click on these icons to follow the latest ACPA social media & video updates. 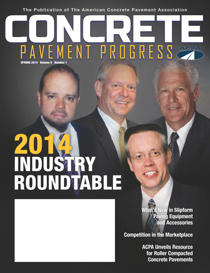 Read more about why concrete pavement is the "Right Choice, Right Now"